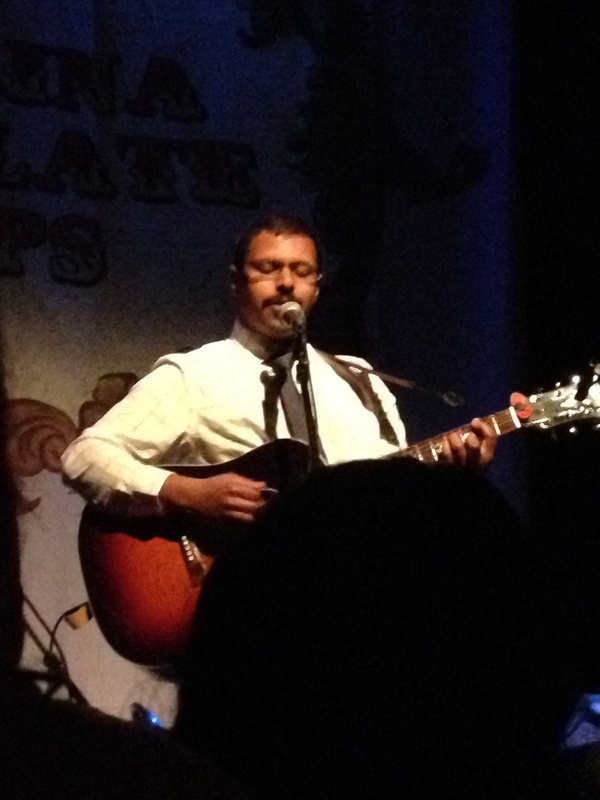 This past Saturday night we headed out to see Bhi Bhiman for the third time in five months. Though he makes his home in San Francisco, he’s been steadily touring in support of his most recent album, Bhiman. In January we caught him playing Park West, and in March we saw him at Schubas. At this rate I assume he’ll be back in June playing at Metro and then again in August to headline Lollapalooza (taking over the Black Sabbath spot). My point is, the guy is here a lot. That seems to be helping get the word out about his record. The crowd at Lincoln Hall seemed to be aware of his work, singing along with a lot of the songs and applauding loudly after most. He was opening for Carolina Chocolate Drops, an americana/roots trio from North Carolina, so it was definitely an audience that would be into his brand of sweetly sung folk. This was definitely the most receptive group of people I’ve seen at one of his shows, and something about that puts a big smile on my face. When I made my list of artists to watch this year, Bhi was right near the top. I had already heard his album, and I knew that if people heard it, he would rise quickly. When we saw him open for Martin Sexton, there was a small segment of the audience that was pretty into it. When we saw him at Schubas opening for Rosie Thomas, people seemed to warm up to him throughout the set. By the end I think he had won everyone over. This most recent show, it seemed like people had come just to see him. Success couldn’t come to a nicer guy. After the show we chatted for a few minutes about the musical Cats and the movie Big. If you go to a show, make sure you talk to him after. He’s a very engaging individual, and seems to enjoy talking to people about whatever topic comes to mind (though food or the Cardinals might be the best ice breakers). I can’t wait to see him again. That’s how I feel after every show. There aren’t many bands I can say that about, but Bhi Bhiman is a great writer and performer. Every time he plays in your town and you don’t go, you’ve squandered an opportunity to see an amazing storyteller perform.